You might not have heard of Hearthstone: Heroes of Warcraft, in which case we need to ask where you’ve been hiding. It’s okay, we understand, there are a lot of new games out there to play. Hearthstone, however, is one that should definitely be on your list to check out, coming from Blizzard, the folks behind World of Warcraft (WoW). If you’re familiar with Magic The Gathering (MTG) or similar trading card games, Hearthstone will feel very familiar. If you do not have any experience with trading card games (both offline/online), Hearthstone is still fairly simple to get the hang of. Hearthstone has been in Private Beta for a few months now. Lucky players send feedback to the small team, of around 15 developers or so, at Blizzard in order to get the game ready for the rest of us. It was recently just announced that the game will be entering Public Beta later this December, allowing more gamers than ever before to try their hand at this intriguing new game from Blizzard. What is Hearthstone really, and why should you care? Once we go over that, you’ll be begging to get into beta. Each class has one respective ability for a set 2 mana cost. For example, Hunters can deal 2 damage to an enemy hero while Paladins can summon a 1/1 Soldier. There are a variety of game modes and Blizzard aims to deliver an epic experience with simple yet well thought out elements of gameplay. There are a few ways to play the game. One way is to build a deck of cards from a set of 3 cards that you can add to your deck – chosen for you at completely random. This keeps things both fair and exciting. Then, you pit your deck and your skills against another player online. For the most part, games won’t last much longer than 10 minutes at a time, making Hearthstone a game more aimed at the casual user than your typical WoW Veteran. This game mode is known as the Arena. The other mode is known as Construction by most users or “Construct Decks” where you build decks out of cards you’ve collected from packs. Packs can be purchased with gold, which can be purchased with real world money. There was an initial argument that this would induce a pay-to-win feeling; however, game mechanics and deck builds show that a casual player will acquire enough variety to put together a competitive deck. After a while, it becomes more of a hunt for legendary (extremely rare) cards. In order to make the game feel epic, Blizzard has created a genuine experience. From the moment you open the game to the moment you start throwing cards down, you’ll notice how good the artwork is and how alive the cards and environs feel. There are animations all over the place, great voice acting and the ability to collect hundreds of cards for yourself in order to form decks and take on the competition. Chances are, if you’re a big PC gamer or console gamer a “card game” doesn’t interest you all that much. They take a bit of time learning the ropes and require strategic thought and planning, as opposed to plug-n-play first person shooters. Unlike previous, more specialized Blizzard games, Hearthstone was built to be a whole lot of fun for everyone. 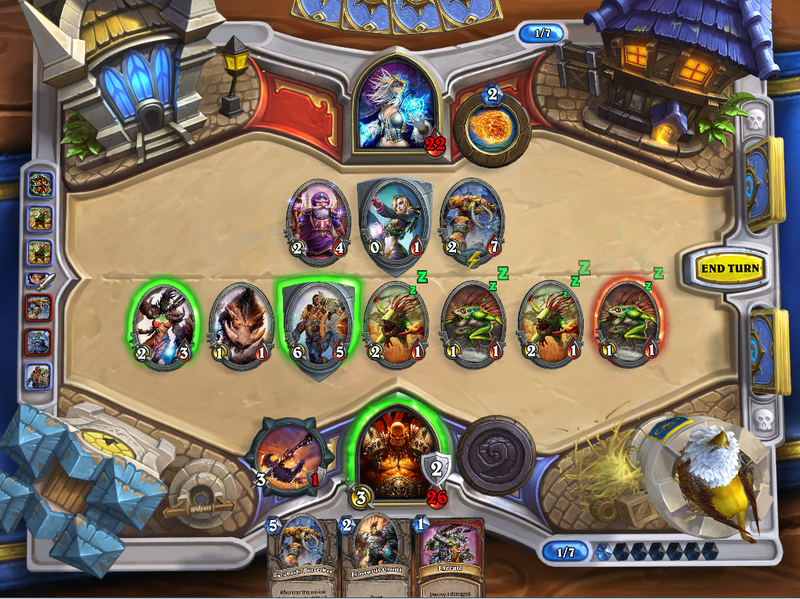 Hearthstone isn’t short of character or graphical flare, and it’s certainly not short of great gameplay. Hearthstone has all of the charm you’d expect from a Warcraft game, minus the complications. There’s no need to know all of the unwritten laws of WoW or remember your place when online. All you do is quickly match to a random opponent, play a card game, have a lot of fun and that’s it. You can also play for hours on end, building up your collection of cards to ogle over, but you can just as easily get in and get out if you’re in a rush. It was conceived with the ability to optimize for mobile devices, which is what truly separates Hearthstone from anything else. It takes the charm from one of the best games out there – WoW – and packages it in a very accessible game. Over the course of the past 4-5 months, many gaming channels and Twitch streams have found profitability and wide interest in Hearthstone (mainly because of the nature of closed beta). With hundreds of “teasers” out there, the launch of public beta has attracted the attention of millions. For even more info, you can head on over to the official website, check out the forums, videos, and behind-the-scenes access.